When the Tripartite Com-mittee on the new minimum wage submitted its report to President Muhammadu Buhari on November 5, 2018, workers were full of expectations. In fact, some had hoped to use the new minimum wage to celebrate the 2018 yuletide season following the National Assembly assurance of an accelerated process once it received the draft bill. Recall that the Tripartite Committee had revealed that it included an executive draft bill in the report submitted to the President. The Ama Pepple-led committee had in the report recommended new minimum wage of N30,000, which organised labour described as a product of compromise. It will be noted that at one of the committee meetings, the Federal Government proposed N24,500, while the Nigeria Governors' Forum, NGF, on the eve of the submission of the committee's report proposed N22,500 after the committee had agreed on N30,000. However, two months after the submission of the Tripartite Committee report, there is no sign if or when the new minimum wage will become a reality. More worrisome is what appears to be government's delay tactics and organised labour intentionally or unwittingly aiding government. An indication that the government is not ready to fast- track the process came after organised labour issued a December 31, 2018, to the government to either transmit a bill to the National Assembly or risk industrial unrest afterwards. Prior to the ultimatum, leaders of Nigeria Labour Congress, NLC, had on December 17, 2018, put the government on notice of a nationwide mobilisation and sensitisation protest slated for January 8, 2019. In its response, the Federal Government through the Minister of Labour and Employment, Senator Chris Ngige, fixed a conciliatory meeting with the leaders of organised Labour on January 4, 2019. 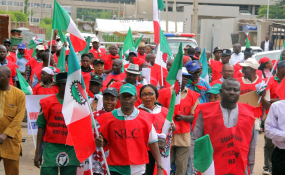 While leaders of the NLC and the Trade Union Congress of Nigeria, TUC, honoured the invitation, leaders of the United Labour Congress of Nigeria, ULC, stayed away, claiming that the three labour centers had on December 20, 2018 met in Lagos and resolved that they would not attend any further meeting on the minimum wage with the government. As explained by Ngige, the meeting was aimed at pacifying labour to shelve the proposed nationwide protest scheduled for Tuesday, January 8, over government's failure to transmit the New National Minimum Wage bill to the National Assembly. At the meeting, the leadership of labour had impressed it on government to forward executive bill on the N30,000 minimum wage as agreed by the Minimum Wage Tripartite Committee to the National Assembly within one week. But the government delegation asked for four weeks to enable it finish its consultations and forward the bill to the National Assembly. Speaking after the January 7 meeting, Ngige informed that the Tripartite Committee's recommendations would also be transmitted to the Federal Executive Council, FEC, National Economic Council, NEC, and Council of State which comprises former Presidents and Heads of State for final ratification, and subsequently send to the National Assembly for enactment into law. Ngige said: "We have made progress and tomorrow (Tuesday), we will know the definite date when the bill will be transmitted to the National Assembly. It has been difficult to arrive at a date because there are processes to follow on the bill. We have to go to the FEC with a council memo on the bill. After that, we will go to the NEC and the Council of State. "We can control the FEC date, the same with NEC, but for the National Council of State, the President has to look at his own time-table and we inform past Heads of State and Justice of the Federation. "This can take two weeks but we are trying to see if we can accommodate all these meetings by next week because we cannot do Council of State meeting again this week. Immediately after that meeting (Council of State), we will transmit." The National Assembly members who were on Christmas and New Year holidays resumed on Wednesday, 16th January, 2019. But it appears the leaders of the organized labour are unknowingly acting and playing the script of the government. Many have wondered why Labour gave a December 31 2018 deadline to government to send an executive bill on the new minimum wage to the National Assembly or risk industrial unrest, and then decided to hold a national protest on January 8. A former labour leader who participated in the last two minimum wage negotiations, faulted the rationale for a protest and further meetings with government after a tripartite committee had concluded its report. According to him, what the leaders of organised labour ought to have done at the December 20, 2018 meeting in Lagos, was to fix a date for a nationwide strike and not protest, saying "I hope our colleagues are not playing into the hands of government. Labour should push the government harder because the elections are around the corner. In few days from now the lawmakers and other government officials will be too busy with electioneering that if care is not taken, the minimum wage issue will become secondary. Labour must take a decisive action now that there is a little window before it is too late." As it is, the uncertainty over the new minimum wage will persist because going by the scenario, the Attorney General of the Federation has to come up with an executive bill to be considered by the FEC, NEC populated by the governors and then to Council of States before taking the bill to the National Assembly. To add to the uncertainty, there is an indication that the National Assembly members may proceed on another break on January 24 to join their parties in the campaigns ahead of the general elections, a day after the Presidency is expected to submit an executive bill on the Minimum Wage to them. At the National Assembly, the bill will be subjected to public hearing and it is not certain whether the lawmakers may have the time to follow the rigorous process before or after the general elections. It should be emphasised that even if the National Assembly passes the bill into law, it will still be transmitted back to the President for his assent before it becomes an act. As it stands, even with accelerated hearing, the earliest to expect the implementation of the new wage would be second quarter of this year. Even if the National Assembly passes the bill into law, it will still be transmitted to the President for his assent before it becomes an act. Going by recent activities, it is doubtful if organized labour will be able to muster the political will and capacity to quicken the implementation of a new minimum wage. For the expectant workers, the N30,000 new minimum wage looks near, but very far.